Breckenridge, Colorado is a truly great place to raise your family. With the mountains as your backyard, winters are fantastic. You'll find your kids skiing or snowboarding and enjoying Breckenridge's "state of the art" indoor and outdoor ice skating arena, which offers children's skate programs, Summit figure skating, and Summit youth hockey. Once the winter snow melts, Breckenridge summers will keep your kids outside and on the go. The Breckenridge Recreation Center offers summer day camp for children ages five to twelve. Sign your kids up for a whole summer filled with daily activities or for Wednesday field trip days to places like WaterWorld, the Denver Museum, and the Glenwood Hot Springs. 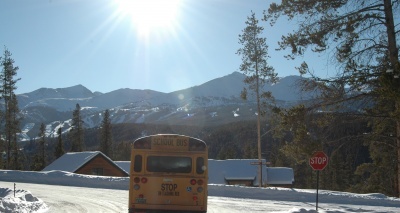 With a huge variety of year round activities, Breckenridge is a seemingly endless playground for children of all ages! Looking for the Perfect Place to Raise a Family? This amazing mountain town offers more than just the best skiing in the country. If you ask locals, they will tell you that its wonderful schools, tons of activities and family-friendly environment make it a great place to raise a family. - Contact us to learn more! During the school year, every age group has something to look forward to. Breckenridge elementary students will participate in winter activities with their school. Students ski or snowboard once a week for 4 to 6 weeks with instructors. It is the mountain town alternative to gym class! The middle school students can join the Nordic ski team, the Alpine ski team or the Snowboard race team. This offers a great opportunity for teens to meet other teens and travel to ski areas all over the state of Colorado. Summit High School provides older students with the opportunities necessary for advancement after graduation. The school offers an internship placement program and extracurricular activities that include the National Honor Society, Yearbook Staff, Music and Drama, Speech and Debate, French and Spanish Club and more. Summit High School also has a wide range of school sports including hockey, soccer, football, gymnastics, cross-country, and Alpine and Nordic Skiing. The Summit School District recently implemented the International Baccalaureate Program (IBO) for students ages three through sixteen. The IBO places a strong emphasis on student's international knowledge and responsible citizenship. It also focuses on expanding a child’s global awareness of a variety of cultures and attitudes. Visit Summit County School's website for more information. As you can see, there is no lack of healthy activities for kids of all ages in Breckenridge. What child or young adult wouldn't want to grow-up in a town that's wonderful activities attract visitors from all over the world? "Growing up in Breckenridge has given me a sense of independence I wouldn't have had if my parents raised me in the city. In a small mountain town like Breckenridge my parents didn't have to worry if I wanted to go hiking or hang out in town. There is a ‘small town sense’ of safety for parents." - Jennifer Shirley age 24.